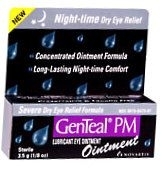 Relieves dryness of the eye. Temporarily relieves discomfort due to minor irritations of the eye or from exposure to wind or sun. As a protectant against further irritation. Preservative and lanolin free. Pull down the lower lid of the affected eye(s) and apply a small amount (1/4 inch) of ointment to the inside of the eyelid(s). Apply one or more times daily or as directed by a doctor. When using this product do not touch tip of container to any surface. Replace cap after using. Stop use and ask a doctor if you experience any of the following: eye pain, changes in vision, continued redness or irritation of the eye, condition worsens or persist for more than 72 hours. Keep out of reach of children. If swallowed, get medical help or contact a Poison Control Center right away.